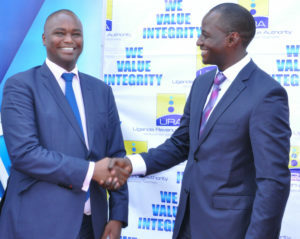 Stanbic Bank’s Chief Executive Patrick Mweheire (left) chats with Ag. Commissioner General Patrick Mukiibi during the launch of the online payment solution on Tuesday. Photo by Badru Afunadula. Uganda Revenue Authority (URA) and Stanbic Bank have launched an online payment solution that will enable taxpayers comply with their tax obligations by making payments using VISA, MasterCard and MTN Mobile money. The platform on the URA website https://ura.go.ug can be accessed on one’s laptop, tablets, phones and other mobile devices and is available to both Stanbic and non Stanbic clients. To make a payment, a taxpayer logs onto https://ura.go.ug and request for a Payment Registration Number (PRN). Thereafter, complete payment using the Stanbic payment tab by simply entering the relevant Visa /Master card details or MTN mobile money account. The bank debits the card or mobile money wallet, processes and posts the payments into URA account. URA is notified about the payment and an electronic receipt is sent to the taxpayer. The receipt confirming payment of the tax is presented to URA. Amid the testing phase from December 1, 2017 to January 31, 2018, over Shs74m was collected. Since the launch of similar e-payment tax solutions in March 2017, over Shs4.5b has been collected through these e-payment platforms. Over the years, Stanbic Uganda has upgraded its services including the Stanbic App, which gives customers a single-view platform for interaction with the services offered by the bank. The solution, he added, would reduce time and unnecessary costs in payment activities, eliminating obstacles to compliance. This new solution is in addition to already existing tax payment solutions namely Cash, Cheque, POS (Pay Way), Mobile money (MTN), Real Time Gross Settlement (RTGS) and Electronic Funds Transfer (EFT).